Acknowledging that the Peoples Democratic Party (PDP) is in obvious lead, several All Progressives Congress (APC) stalwarts have started reaching out in secret meetings with Atiku Abubakar, the PDP Presidential candidate in the February 16 election with a view to working out “exit deals”. 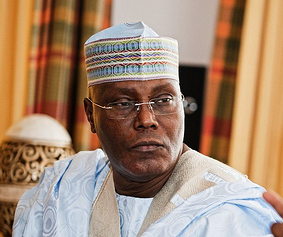 Among those reaching out to the PDP presidential candidate are the APC party chairman, Comrade Adams Oshiomhole, Minister of Transportation and Director General Buhari Presidential Campaign organisation, Chibuike, Rotimi Amaechi and the Minister of Internal Affairs, General Abdulraman Dambazau, a very reliable source close to the Atiku camp disclosed. Also elements from Tinubu’s camp believed to represent the interests of the “Bourdillon strongman” are among those reaching out to Atiku as revealed. Though details of this group’s discussions with the PDP presidential candidate are scanty, it may also not be unconnected to negotiating an “exit deal” to protect Tinubu’s interests post May 29 2019. In the last few weeks, the PDP presidential candidate has continued to surge far ahead the incumbent president in both internal and foreign polls. This obviously may have set panic measures in the camp of the ruling party and like most Nigerian politicians, self interest and preservation comes first before any talk of party loyalty or interests. Recall it was reported last week that President Buhari in a desperate attempt to salvage the slipping fortunes of his re-election bid started reaching out to some PDP chieftains with huge monetary enticement and promise of incorporating them into his new government if they can work to weaken Atiku’s surging fortunes in the coming election. However, some of those being cajoled reported the president and his team’s subversive actions to the leadership of the PDP Presidential Campaign Organisation where they were asked by the campaign strategy group to continue to play along with the president and his team as this would let in the opposition into the president’s inner workings. When contacted, Mr Paul Ibe, Media Adviser to Atiku Abubakar declined to comment. The presidential election is slated for this Saturday February 16, 2019.